The world has had enough of their time wasted by Bibi Netanyahu. Here’s a perfect example of the lies he’s been telling, to anyone he can coerce into listening, since even before 911 took place. When it comes to Iran and their mythical nuclear-weapons accusations, nothing Israel claims is true! Yesterday at the UN Bibi said! “Iranian missiles will hit New York in “three to four years”. A nuclear Iran is like “50 North Koreas”. This could be the sound of a deranged, dangerous sociopath, or this could be the sound of Israeli Prime Minister Benjamin “Bibi” Netanyahu addressing the UN General Assembly. Compare for yourself. Last week we had Iranian President Hassan Rouhani calling for the world to surf a WAVE (as in World Against Violence and Extremism). This week we had Bibi saying that was a “cynical” and “totally hypocritical honey trap”. Ranting aside, Bibi did change his game. Now it’s not silly cartoons and begging the US to bomb Iran virtually on a weekly basis. Now it’s Iran’s “military nuclear program” that must be shut down ­ a program, by the way, that the alphabet soup of US intelligence agencies says does not exist. “To KILL any hopes for peace in the Middle East. For anything short of war spoils their plans for hegemony in the region. Preparing for the Jewish destruction of peace talks between Iran and Jewmerica, Netanyahu just arrived in DC to first browbeat Obama into submission followed by a bribing session with the already Jewish-bought hacks on Capitol Hill. And Israel’s unregistered foreign lobby AIPAC is on the warpath. What would Netanyahu do without Iran to demonize as a “nuclear threat” and keep the coffers of US aid flowing? The Jews are afraid that if the ‘Iranian Question’ is solved, Israel will be boxed in, forced to declare their nuke inventory, and pressed to sign the Nuclear Non-Proliferation Treaty. “The whole issue in Syria is not about chemical weapons. The rebels are being sponsored by outside forces in Saudi Arabia, Turkey, Qatar, the US and France, is who is sponsoring the rebels. The main purpose behind destabilizing the Assad regime has been to hijack the concept of an oil pipeline from Iran and Syria to Western Europe to break the Oil Monopoly. What the people of the world need to understand is that the situation in Syria is about one thing, it’s about money. It’s about control of the supply of oil to the world. Iran, Syria and Russia have agreed to put a pipeline that will supply oil to China in the East and will supply oil to Europe in the West. If that pipeline is successful and is built it will take control of the global energy supply away from the Western Oil Cartels and it will allow for a true competitive free-market. “(3) Continues: BIBZY IS LINING UP his patsies on Capitol Hill. With mission in hand to “tell the truth” in the face of what he calls “sweet-talk” from Iran vis-a-vis Rouhani’s promise to limit uranium enrichment for peaceful purposes only, Bibzy is setting the parameters for ‘peace talks’ between America and Iran. As signers of the Nuclear Non-Proliferation Treaty, Iran has every right to peaceful nuclear energy. Rouhani is BOLDLY insisting that Israel does the same by signing the NPT. But IsraHell and its unregistered Jewish Lobby remain traitors to America’s (and the world’s) best interests.”. AIPAC HAS SET the killing field to decimate any chance of success in upcoming talks between Obama and Rouhani. on Capitol Hill (among MANY others) who hopes to be next president has taken the Jew bait…Senator Ted Cruz. This demand is IMPOSSIBLE to meet for those who support the “right of return” (as Rouhani does) of the Palestinian victims of Jewish theft, genocide, and usurpation. But all hail Jewish rule in Jewmerica! If there’s a chance for peace in the world AND the end to political corruption in Jewmerica…you can count on it…Jews will KILL IT in a MINUTE. What needs to die here is the illegal and treasonous Jewish Lobby that’s composed of Jewish 5th column traitors, since AIPAC was founded. This is too much treason even for the Zionists. Nero needs to stop commuting to Israel every week, or allowing Netanyahu, the Israeli saboteur to come here to DICTATE to the US while DEMANDING MORE and MORE American MONEY to feed this blatantly illegal bunch of outlaws that call themselves Israeli’s! One day someone will probably put an AK-47 into Bibi’s mouth and empty a full clip into him ­ that’s the only way that he will ever be silenced. What has changed many will ask? 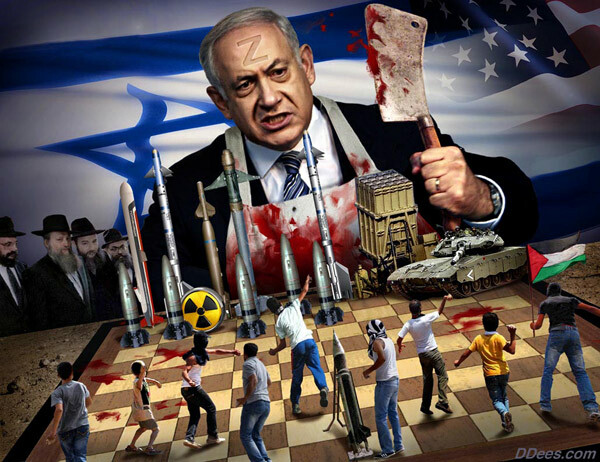 2) Netanyahu’s UN Speech sounds like a Sociopath?